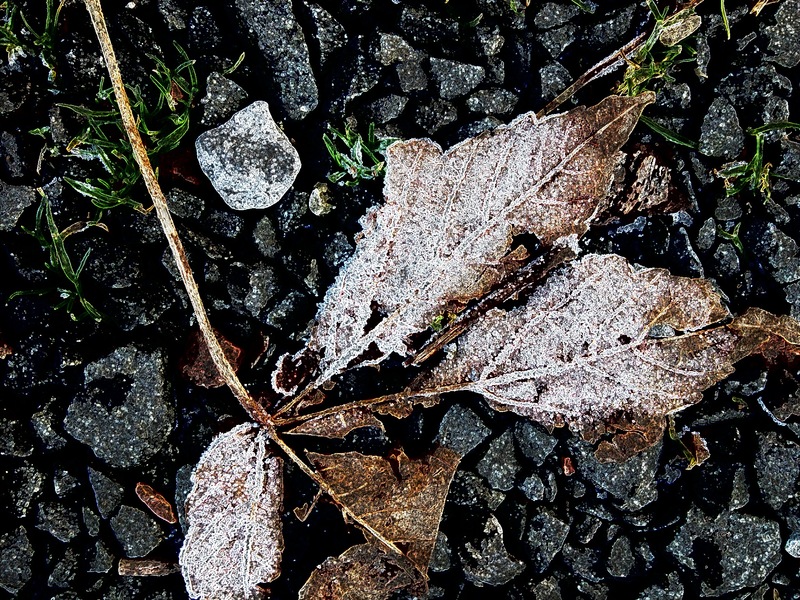 I love the simplicity of this frozen leaf laying on the ground. I used the Paper Camera app to edit this shot. 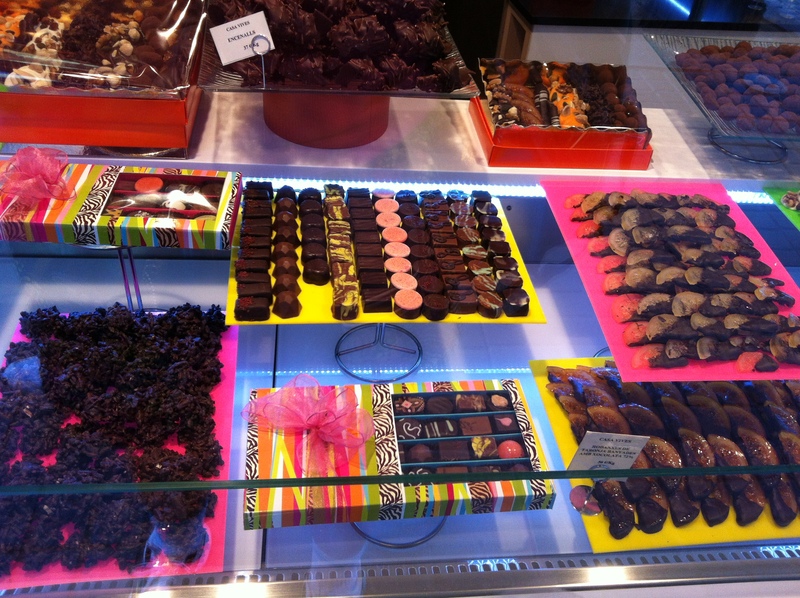 I was revisiting my photographs from last July in Barcelona and I thought the chocoholics amongst you would like to drool over this shot of a shop window on Rambla de Catalunya. I don’t eat chocolate myself as it’s one of my migraine triggers, but I do know that for lots of you it counts as one of your five a day!!!! When it’s cold and icy outside it’s great to remember the warmth and relaxation of those summer days. I love the colours and patterns in this shot which was edited in the Painteresque app on the Rainbow setting. I took the original photograph at Tynemouth station and really like the zingy greens and yellows that the app has created. I had great fun editing this shot of winter trees. I edited three times in total and firstly I used the FilterMania 2 app to give me the glow behind the trees. Secondly I used the Toon Camera app to eccentuate the lines and finally the InfiniFX to posterize the final photograph. I love the way it looks as if the sky is on fire. 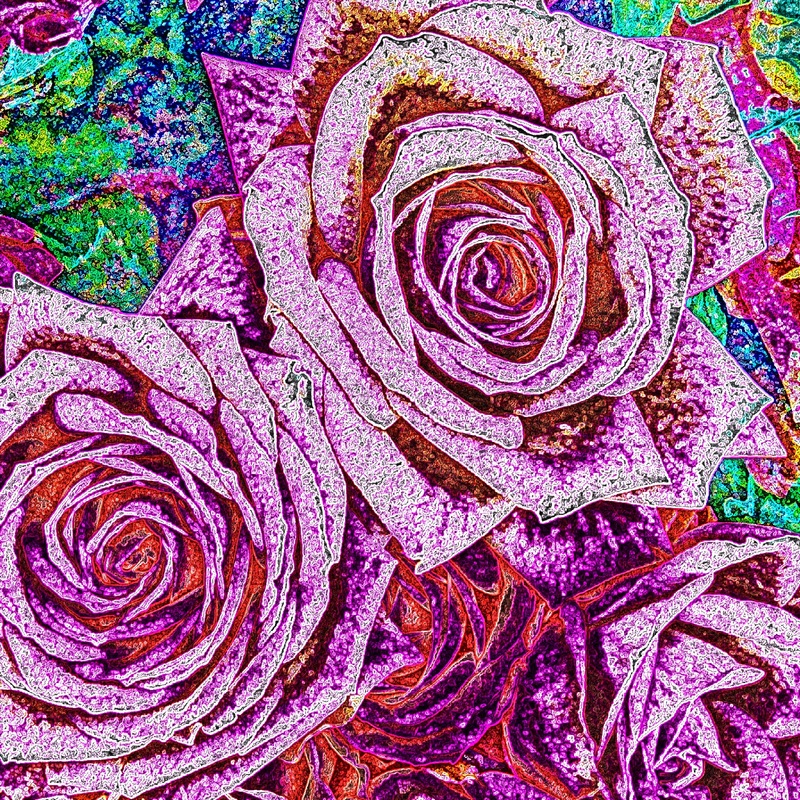 I love this shot of roses taken at our local market. I edited the shot twice, firstly with the Painteresque app on my favourite Rainbow setting and secondly in the Paper Camera app on the Neon setting. I like the unexpected orange tones that have appeared in the petals. 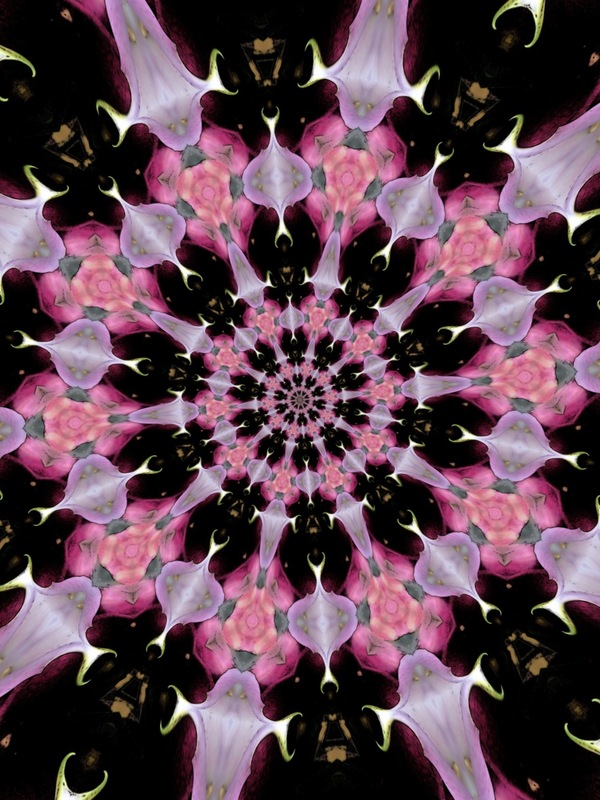 I used the KaleidaCam app to alter this photograph of a Stargazer Lily. 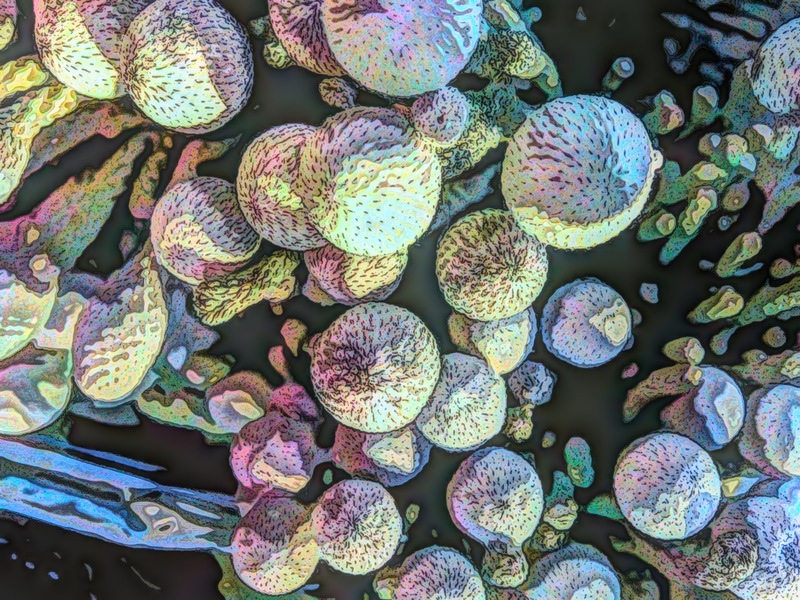 I love the patterns and colours that the app has created. I’m really please with the finished effect of this photograph. I took a shot of distant trees on the right and the branch on the left and have then used the Forest Lake filter in the Filtermania 2 app which has added the river and foliage in the foreground. 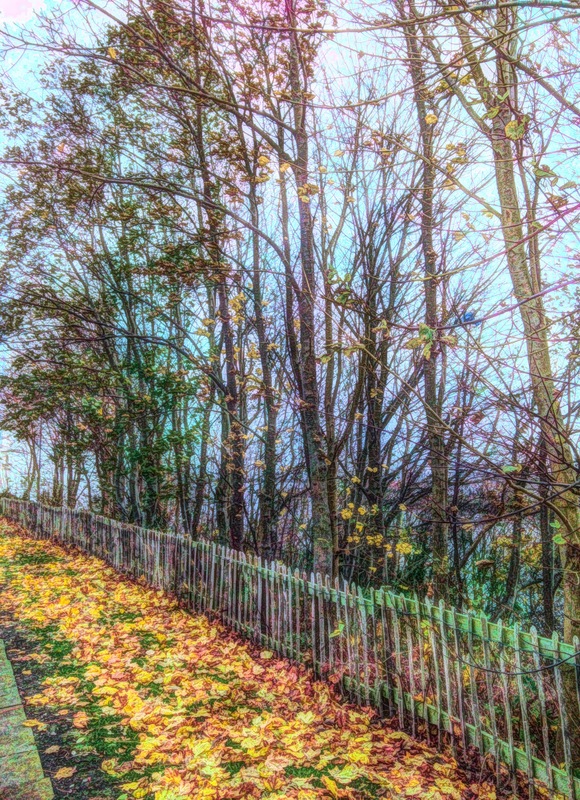 I then took it for a spin through the Pix app to sharpen and deepen the rusty colours in the trees. I must admit I’m rather impressed. I’m not so impressed with the inability of the Filtermania 2 app to link to Facebook though. Here is another wonderful photograph of the graffiti found on our holiday in Barcelona last July. 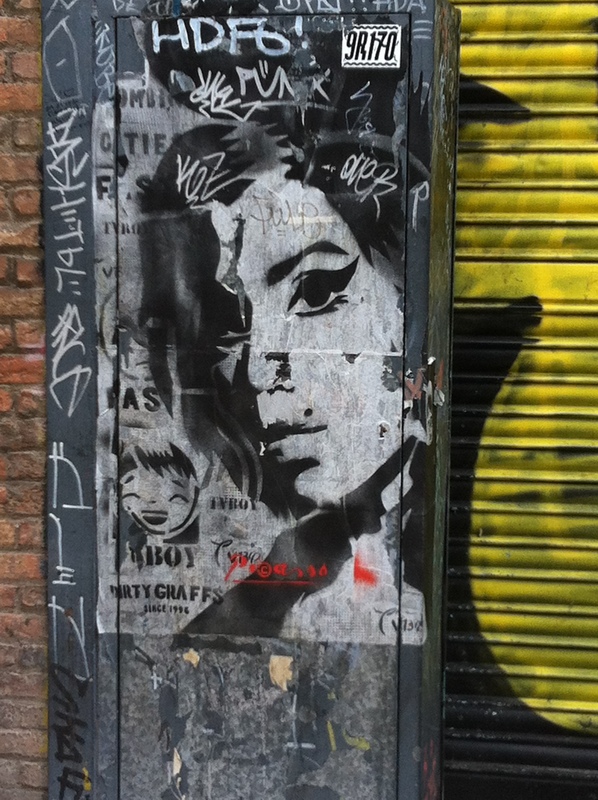 I’m sure it’s Amy Winehouse but then I did wonder if it was Sophia Lauren? I’m also sure if this was found in Britain, someone would have already painted it over in a uniform coating of grey paint. I love the fact that all the other tags and pictures only add to the overall effect. 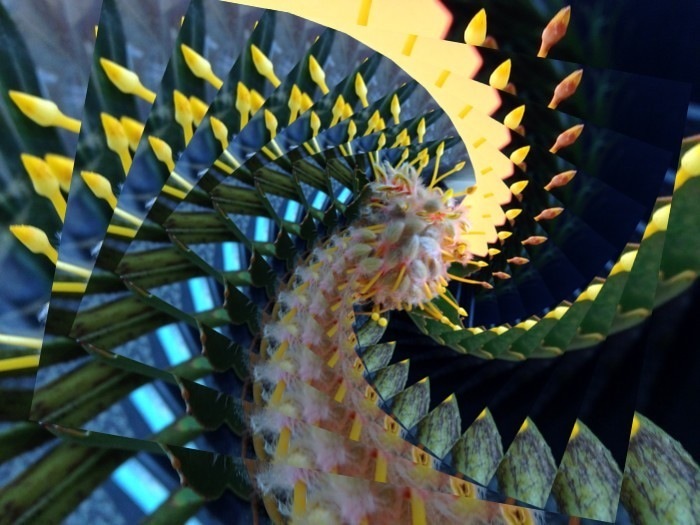 I promised you more KaleidaCam photographs and this shot is of a die cut butterfly previously featured in the post on 22 October. I love the way the glitter and pearlescent card stock have added a certain something to the image. I edited this shot with the Toon Camera app and love the way it has enhanced the details and brightened the original colours. 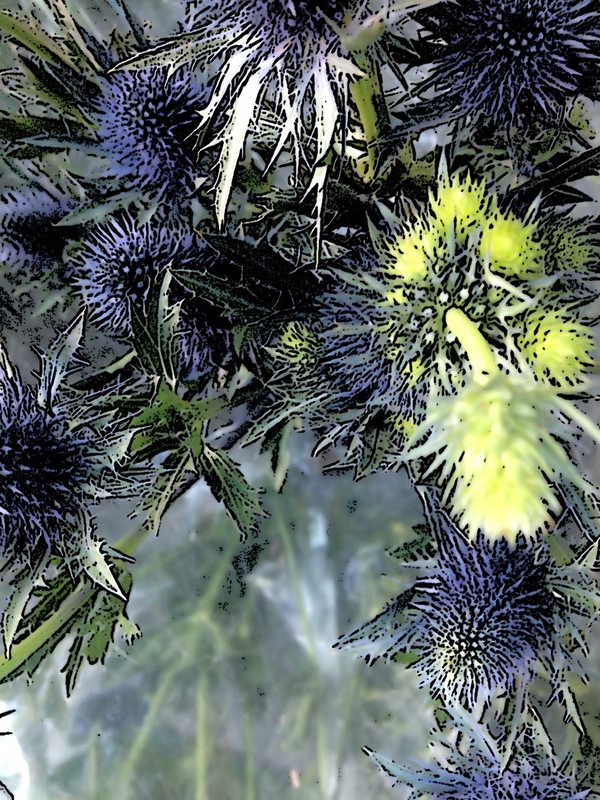 The cellophane packaging in the background is a great counterfoil to the spikyness of the Eryngium. It was the lovely Lesleys birthday recently and this is the card I made for her. She loves it so much she is going to turn it into a calendar. I take it as a huge compliment that she she wants to look at it for a whole year! 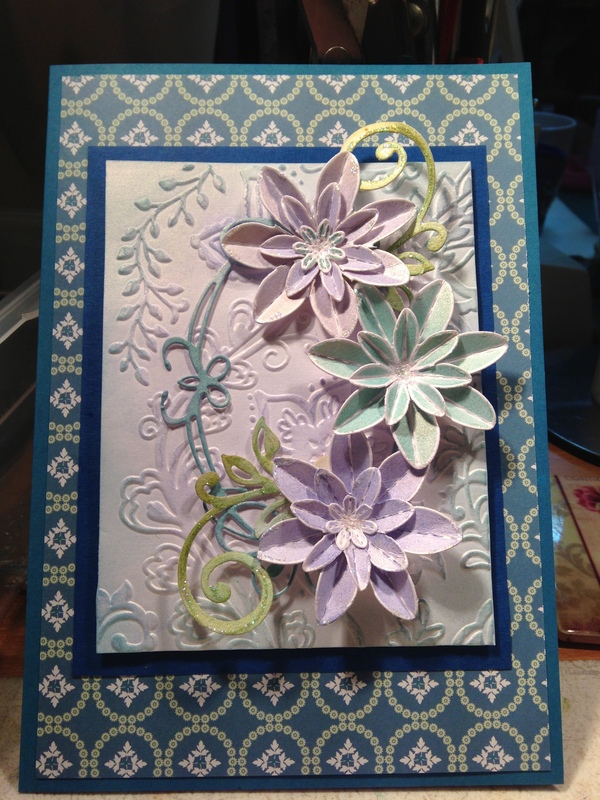 I used a Kreaxions flower die from Craft Habitat, a Sizzix embossing folder, a Joy swirl die and a Memory Box frame die. The card was pearlescent white with a hint of gold and I used Distress inks to colour the whole thing. I like the addition of the scrapbook paper for a backdrop to the card topper and have used Stickles glitter glue to highlight everything. I’ve been told by the lovely Cheryl that I do like my sparkle! I featured this Mystery plant on the 13 November and I still don’t know what it is. I love this shot and it has been edited firstly in the Toon Camera app and the rainbow setting in the Painteresque app. I love the colours and contrast in light and shade. 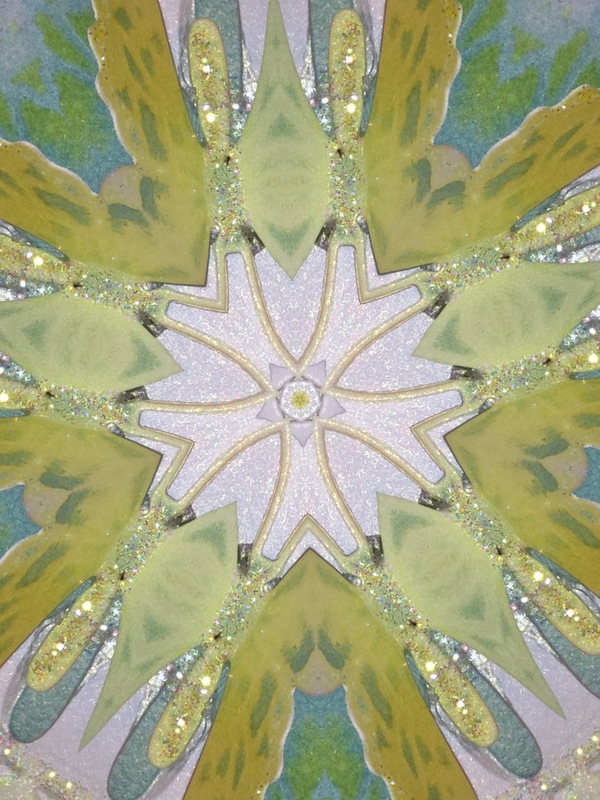 I’ve found a new app called KaleidaCam and I love it! You have the ability to take photos and also alter library shots with this app. I like the way you can turn the image with your finger on the screen to change the effect even more. I must admit I have spent ages playing with this app….. expect more images soon! I used the native camera on my iPhone 5 to take this photograph of ice crystals over fungus. Kristy, Dan and I took a trip into the country to visit a farm shop and it was extremely icy. Right click on the shot and open in a new tab to see the crystals in detail. I created this card for a family friend as he loves Graffiti. I was a bit stumped for ideas until I remembered a little book called Zenspirations – Letters & Patterning by Joanne Fink and had great fun drawing the letters and patterns. If you click on the link it takes you to Amazon. Dan loved his card by the way. I edited this photograph of a green Chrysanthemum featured in the post on the 18th November with the Picfx app. 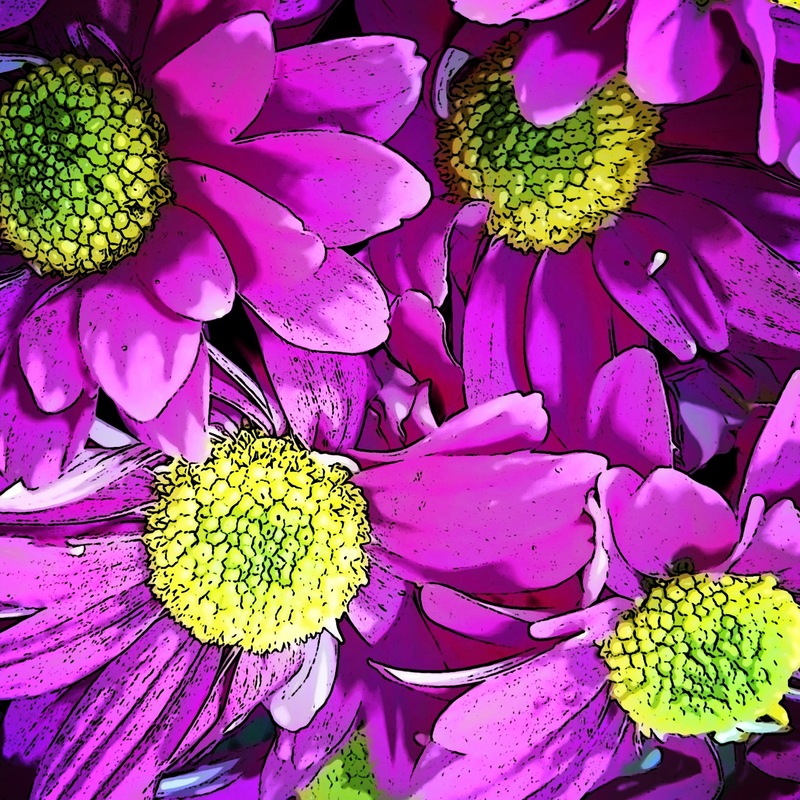 I love the colours and patterns created within the flower by the app. I edited this shot with the FilterMania 2 app. 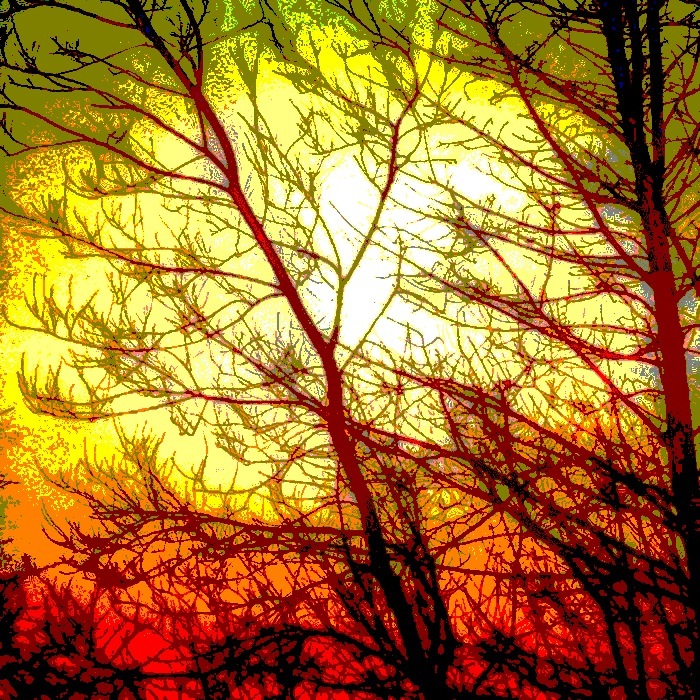 I love the overlay of the autumn leaves onto my original photograph. The app has lots of different filters which have to be downloaded individually but are well worth the time it takes. 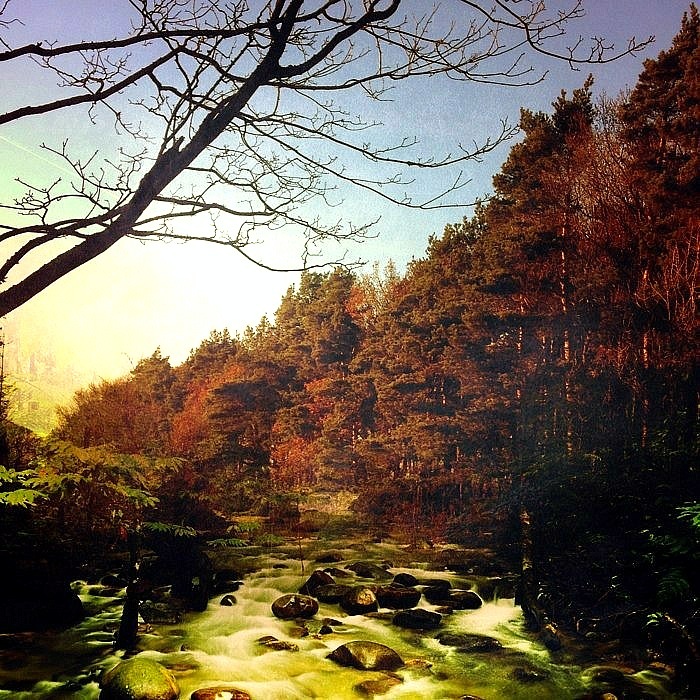 These include a great selection of landscapes which turn a simple picture into something spectacular. 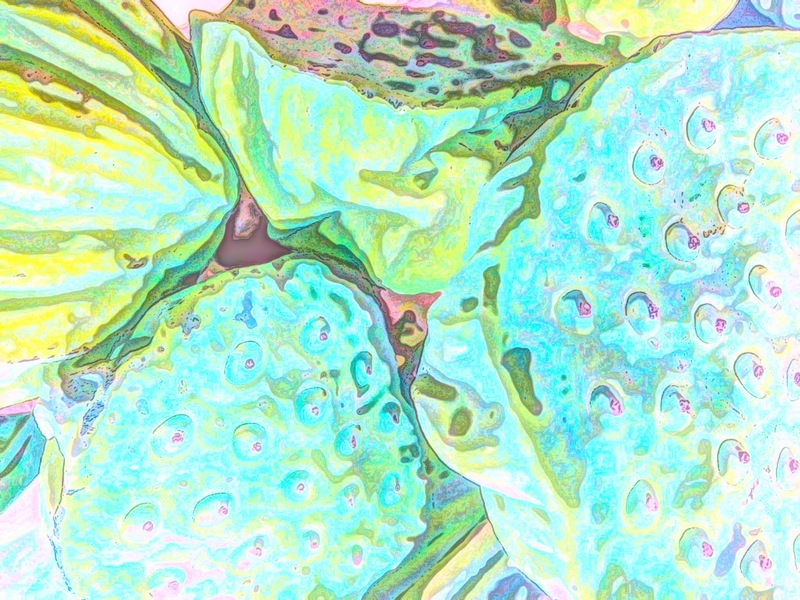 I used the SuperPhoto app to edit this shot of a Protea flower and I am enjoying the patterns created by the app. I can see rows of teeth, plaits and a scalloped edge just for starters. What patterns can you see? Let me know. I love the zingy contrast between the cerise of the petals and the limey yellow centers. I edited the shot with the Toon Camera app which has defined the edges and shadows. Whilst waiting for Jade yesterday lunch time I stopped to take some photographs. I edited the shot of a little stand of trees overlooking the Fish Quay in NorthShields with the Rainbow effect in the Painteresque app. It has really brightened the leaden sky and fallen leaves.